New study suggests life originated on Earth a lot earlier than previously thought. 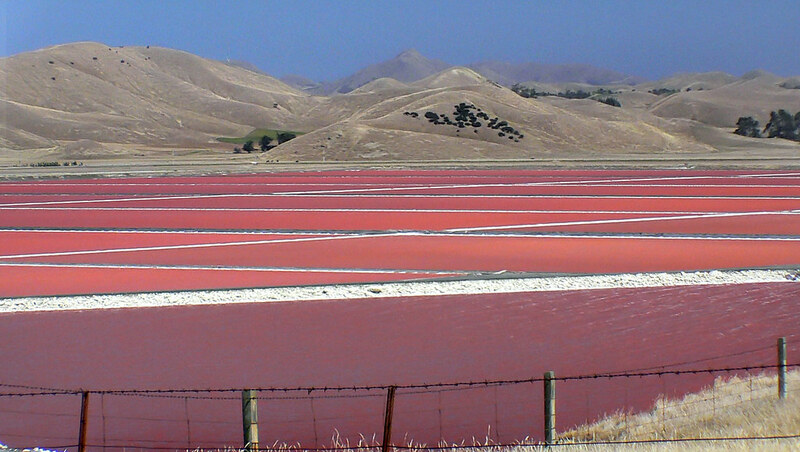 Salt-marshes are coloured pink by salt-loving (halophilic) archaebacteria. Palaeontologists have long sought to understand ancient life and the shared evolutionary history of life as a whole. However, the fossil record of early life is extremely fragmented, and its quality significantly deteriorates further back in time towards the Archaean period, more than 2.5 billion years ago, when the Earth’s crust had cooled enough to allow the formation of continents and the only life forms were microbes. A new study led by the University of Bristol and co-authored by Dr Mark Puttick from the Milner Centre for Evolution at the University of Bath used a combination of genomic and fossil data to explain the history of life on Earth, from its origin to the present day. Fossil evidence for the early history of life is so fragmented and difficult to evaluate that new discoveries and reinterpretations of known fossils have led to a proliferation of conflicting ideas about the timescale of the early history of life. Dr Puttick helped in the analyses using the 'molecular clock', a technique based on the premise that the number of differences in the genomes of two living species (for example a human and a bacterium) is proportional to the time since they shared a common ancestor. By making use of this method the team was able to derive a timescale for the history of life on Earth that did not rely on the ever-changing age of the oldest accepted fossil evidence of life. Dr Puttick said: "This research is exciting as it clarifies a timescale for the evolution of life on Earth, which is impossible to capture from fossil evidence alone. By utilising molecular information from living organisms throughout the tree of life alongside fossil information, we have generated a temporal history for the evolution of life. "These results show life on Earth is very ancient, as last common ancestor of life originated around 4.5 billion years ago, and the major lineage to which we humans belong alongside animals, plants, and fungi is much more recent (~1.5 billion years ago)." "We cannot rely on the fossil record alone to date these major events as it is too incomplete, but the molecular clock allows us to estimate when living organisms shared a common ancestor by estimating the changes in their molecular make-up. "As these changes accumulate through time we can use the relative differences in molecular information to estimate when organisms last shared a common ancestor, using the fossil record as a constraint. "The molecular clock is a powerful tool that highlights the 'living history' possessed in genetic information of life today that can be used to generate a timescale of evolution on Earth." Co-author Professor Davide Pisani said: “Using this approach we were able to show that the Last Universal Common Ancestor all cellular life forms, ‘LUCA’, existed very early in Earth’s history, almost 4.5 Billion years ago – not long after Earth was impacted by the planet Theia, the event which sterilised Earth and led to the formation of the Moon. “This is significantly earlier than the currently accepted oldest fossil evidence would suggest. “Our results indicate that two “primary” lineages of life emerged from LUCA (the Eubacteria and the Archaebacteria), approximately one Billion years after LUCA. This research was funded by the Natural Environment Research Council and the Biotechnology and Biological Sciences Research Council.